WELCOME TO THE BENTLEY OFFICE INTERIORS WEBSITE! We are a privately-owned office interiors company, established in 1987 with a nationwide installation and distribution team. Our in-house CAD (Computer-aided design) facilities create accurate, clear drawings for every level of the design. To establish Bentley as a key independent office furniture and interiors business. By understanding our clients business and objectives and then offering a total solution to their specific needs and to provide a level of service that exceeds their expectations. 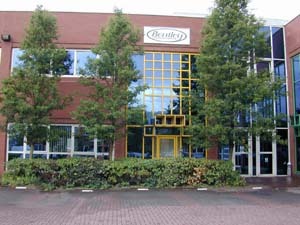 Bentley Office Interiors was founded in June 1987. Hi-tech office complex 6000sq ft of working showroom and warehouse facilities. Normally Monday-Friday 6.30am - 6pm plus, additional hours for fitters to build furniture during week days and weekends. Fully integrated Order Processing and Accounting Software system specifically designed for the office stationery and furniture distributer. Three stand alone PCs for Word Processing and Customer Link. Dedicated CAD PC with software and plotter for office layouts.